In the past decades, recombinant proteins have found use not only in the scientific field but also in medical, agricultural, and industrial applications. For such applications, cultured cells have mostly been used as hosts for production by exogenous expression of foreign genes. Complex and costly mechanical bioreactors are however needed in order to carry out this type of mass production of recombinant proteins . With the aim of developing cost-effective methods to produce large amounts of recombinant proteins, plants and livestock animals have been targeted as potential bioreactors [2, 3]. However, and even some of these proteins have been purified and commercialized for therapeutic use, transgenesis in animals and their use as bioreactors is relatively inefficient and time consuming . In this context, chickens emerge as a promising bioreactor if they can be genetically modified to produce high amounts of specific recombinant proteins in their eggs, as chicken housing and egg production is inexpensive and such proteins could be economically obtained in large yield [2, 5, 6]. Other advantage of expressing recombinant proteins in chicken cells is the way this species modifies proteins post-translationally. The post-translational modifications of polypeptides in chickens (precisely the addition of oligosaccharide residues) are structured in a manner similar to human oligosaccharides. In contrast to CHO cells or other mammals as those currently used as bioreactors, in the chicken the N-acetylneuraminic acid (NANA) is added to the terminal residue of N-glycans . In this way, the possibility of allergic reaction in humans triggered by proteins synthetized in chicken cells is radically reduced. So far, a number of transgenic chicken lines producing a recombinant protein in egg white have been established by embryonic microinjection of a lentiviral or retroviral vector. In most cases, however, the amount of foreign protein produced in egg white is really small (reviewed in ). Alternatively, vectors of a non-viral origin have been used to produce transgenic chickens using competent primordial germ cells (PGCs) in culture [8, 9]. With the advent and recent surge of genome-editing technology the efficiency of gene targeting in PGCs has radically increased, rendering increased germline transmission efficiency and making the generation of transgenic chickens a more efficient procedure [10, 11, 12]. The chief problem of human recombinant protein production in egg whites, however, is that these proteins lack a terminal sialic acid in N-glycan, which mainly affects the half-life of proteins in serum, activity and folding (reviewed in ). This is most probably due to the lack of sialyltransferases, enzymes that are detected in the liver and kidney of chickens but are absent in the oviduct cells in which egg-white proteins are produced . The use of alternative promoters, for example and most conveniently the vitellogenin promoter, would overcome this drawback and avoid the need of additional engineering of transgenic chickens essential to make them express different forms of galactosyl transferase that would produce galactosylated therapeutics. In fact, and as mentioned above, one of the great advantages of using chickens as bioreactors is the benefit of using a species that would render recombinant proteins that have human-like glycosylation. It would be desirable therefore to express the recombinant protein of interest directly in a tissue that actually renders human-like glycosylation in order to profit from this characteristic of chickens. Vitellogenin is the precursor of the peptides present in the yolk. The gene is exclusively expressed in the liver in response to steroid stimulation. The protein is then taken up and stored in the yolk via receptor-mediated endocytosis during the days prior to ovulation and cleaved in the egg by the enzyme Cathepsin D, generating the major peptides present in egg yolk. Each egg (e.g., from a White Leghorn hen) has approximately 3.5 gr of vitellogenin in the yolk. The sequence of the chicken vitellogenin II gene has been well studied, positive and negative regulatory elements have been identified in the promoter region within the first − 1000 bp downstream and + 40 bp upstream of the transcription start site and there are several studies describing the regulation of the expression of this promoter [14, 15, 16, 17, 18]. These features make chicken vitellogenin promoter an ideal tissue-specific promoter to include in genetic constructions used to generate transgenic chickens that express recombinant proteins in their eggs. In this work we demonstrate that a small and very simple DNA construct consisting of a ~ 2.2 kilobase (kb) fragment of the 5´-flanking region of the chicken vitellogenin II gene cloned in a reporter vector, is capable of showing the ability of the promoter to drive expression of a reporting gene in a tissue-specific manner exclusively in hepatic cells and in response to the steroid stimuli that physiologically induce vitellogenin expression in the chicken, making it an ideal candidate to be used in the future for the generation of avian bioreactors. Besides, we develop and validate an in vitro culture system to test the performance of the DNA construct under study that could be used as a practical and useful tool before generating the transgenic chickens to verify specificity and efficacy of the DNA construct that is being studied. 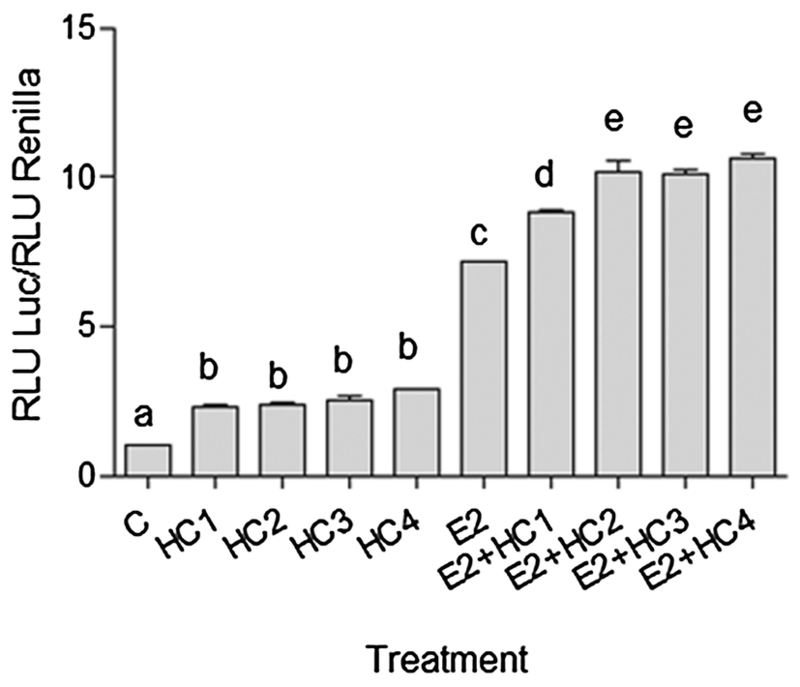 Although in vitro and preliminary to the generation of the transgenic chicken, our results are of great importance since they provide the bases and lay the foundation and rationale for future genetic modification of chicken PGCs and the production of improved chicken bioreactors bearing tissue-specific promoters alternative to the ovalbumin promoter and its intrinsic disadvantages. Tissue culture reagents, 17β-estradiol (estradiol), fulvestrant/ICI182,780, medroxyprogesterone acetate, mifepristone, and all other chemicals were obtained from Sigma Chemical Co. (St. Louis, MO, USA), unless otherwise indicated. Enzymes were purchased from Invitrogen (Carlsbad, CA, USA). The reporter vector VTG-Luc was generated as previously described . Briefly, a ~ 2.2 kilobase (kb) fragment of the 5´-flanking region of the chicken vitellogenin II gene (GenBank accession number: NW_001471740, Gallus gallus chromosome 8) was PCR amplified from genomic DNA isolated from chicken fibroblast. The amplified fragment spans nucleotides − 2147 to + 14 (relative to the start of transcription of the vitellogenin gene), a vast region that contains the reported regulatory sequences of the vitellogenin II gene. This fragment was first subcloned into the pGEM-T Easy cloning vector (Promega, Madison, WI) and subsequently inserted into the SacI and BglII restriction sites of the pGL3-Basic Vector (Promega, Madison, WI). The resulting plasmid, after confirmation of the identity and integrity of the cloned fragment into the luciferase vector, was named VTG-Luc. The use of this construct in chicken cells has been previously reported . Fertilized eggs from a Cobb breeding flock were facilitated by Tres Arroyos Farm (Buenos Aires, Argentina), incubated at 38.5 °C with a relative humidity of 60%, treated in ovo during 48 hs with 1.25 mg of 17β-estradiol dissolved in propylene glycol in order to induce estrogen receptor expression , and killed on day 14 of incubation by decapitation. Induction of estrogen receptor expression in the embryo by means of estradiol treatment of the egg is needed in order to detect changes in classical estrogen-responsive genes like vitellogenin or ApoVLDLII genes (otherwise, chicken embryo hepatocyte –CEH- levels of estrogen receptor are too low). The animal procedures were reviewed and approved by the Animal Research Committee of our Institution, which follows the guidelines of the National Institutes of Health, USA. Livers were isolated and hepatocytes prepared as previously described , with some minor modifications introduced in order to improve purity and yield . For transfection experiments cells were seeded on collagen-precoated P6 multiwell plastic plates (Orange Scientific NV/SA., Belgium) at a density of 2.0 × 105 viable cells/cm2 and maintained in serum-free medium. Cells were cultured at 38 °C with 5% CO2. Fertilized eggs from a Cobb breeding flock were facilitated by Tres Arroyos Farm (Buenos Aires, Argentina), incubated at 38.5 °C with a relative humidity of 60%, and killed on day 6 of incubation by decapitation. After removing viscera, embryos were mechanically disaggregated and incubated at 37 °C with a DMEM: Hepes solution containing 0.05% trypsin. After centrifugation, pellet was resuspended in DMEM:Hepes containing 8% fetal bovine serum, 2% normal chicken serum and antibiotics. Cell preparation was seeded on 60 mm plates (Orange Scientific NV/SA., Belgium) and maintained at 38 °C with 5% CO2. After 24 h, media were changed to remove non-attached cells and fibroblast cultures further maintained in DMEM:Hepes containing 5% fetal bovine serum, 5% normal chicken serum and antibiotics, at 38 °C with 5% CO2. Subculture by trypsinization was performed when necessary, and for transfection experiments cells were seeded on P6 multiwell plastic plates (Orange Scientific NV/SA., Belgium) at a density of 7.5 x 104 viable cells/cm2 and maintained in serum-free medium throughout the experiment. Chicken hepatocellular carcinoma LMH cells were obtained from the ATCC (catalog no. 2117-CRL) and thawed immediately after arrival. They were cultivated in Waymouth’s MB 752/1 medium supplemented with 10% fetal bovine serum and antibiotic–antimycotic (Gibco) on 0.1% gelatin-coated dishes and maintained at 38 °C with 5% CO2. For transfection experiments cells were seeded on P6 multiwell plastic plates (Orange Scientific NV/SA., Belgium) at a density of 2.0 x 105 viable cells/cm2 and maintained in serum-free medium throughout the experiment. LMH cells, chicken embryo hepatocytes, or chicken embryo fibroblasts cultured for 24 h in P6 multiwell plates were preincubated in OPTI-MEM® GlutaMaxTM (GibcoTM, Invitrogen Corporation, Auckland, NZ) for 30 min and then transiently transfected with the reporter control construct pTK-Red-ERE-LUC (kindly given by Dr. M. Beato), the reporter construct VTG-Luc, or an estrogen receptor expression vector. The strong estrogen-responsive control construct pTK-Red-ERE-LUC is a validated synthetic reporter vector consisting of a constitutive minimal promoter bearing estrogen response elements inserted in front of it and the firefly luciferase gene cloned downstream . This synthetic estrogen-responsive reporter vector is utilized in these experiments because its use is well established and it has a high expression rate [19, 22, 23]. The transfection was made using LipofectamineTM 2000 Reagent (Invitrogen, Carlsbad, CA, USA) at 0.3 µl liposomes/cm2 and 50 ng DNA/cm2 in OPTI-MEM® GlutaMaxTM medium. Along with the estradiol- inducible reporter constructs, cells were cotransfected with the control reporter plasmid pRL-SV40 (Promega, Madison, WI, USA) which expresses Renilla Luciferase as the second reporter. Sixteen hours post-transfection, fresh media (DMEM-F12 1:1 without phenol red and without serum) containing the different stimuli were added. After 32 h of stimuli, cells were washed twice with PBS, lysed in 200 µl of 1X Passive Lysis Buffer (Promega, Madison, WI, USA), and the cleared extract was assayed for luciferase activities using the Promega’s Dual-LuciferaseTM Reporter Assay System (Promega, Madison, WI, USA) and according to the manufacturer’s instructions. Transfection efficiencies were normalized by Renilla luciferase activity in each well, and firefly luciferase activity expressed as relative light units, as fold induction or inhibition of the activity observed in the vehicle (ethanol) controls, which was set arbitrarily to 1. Treatments were applied to at least duplicate wells in each of three separate experiments, unless otherwise indicated. Results are expressed as the mean ± SEM of the independent experiments. Statistical comparisons of the results were made using one-way ANOVA and Tukey–Kramer’s test for multiple comparisons after logarithmic transformation of data when necessary . With the aim of determining if the VTG-Luc construct, conceived and designed to respond to estrogen stimulation in the way endogen vitellogenin does, is able to be induced by estradiol, we performed a series of experiments in primary chicken hepatocytes transiently transfected with the DNA construct under study. Concomitantly, hepatocytes cultured in parallel were transfected with the reporter construct pTK-Red-ERE-LUC, which functioned as a positive control of estradiol stimulation. This synthetic estrogen-responsive reporter vector is utilized in these experiments because its use is well established and it has a high expression rate [19, 22]. As can be seen in Fig. 1b, estradiol was able to induce a 5-fold stimulation in the transcription of the reporter gene in the construct under study. This effect was reversed by co-treatment with the pure anti-estrogen ICI 182,780 and is comparable to the effect observed when cells were transfected with the control construct (Fig. 1a). The chicken cell line LMH has been used as a homologous cell line for studies of the expression of some avian liver genes in specific culture conditions  and has been validated in our culture conditions for the study of estradiol-elicited transcriptional responses as an alternative to the use of chicken embryo hepatocytes primary cultures . By means of transient transfections, we tested the response of the reporter construct under study in this cell line and observed that estradiol is able to induce the activation of the vitellogenin promoter present in the DNA construct more than seven times (Fig. 2b). The estrogen-induced transcription observed in LMH cells is comparable to that obtained in chicken embryo hepatocytes (CEH), and is reversed by co-treatment with the pure anti-estrogen ICI 182,780 as well (Fig. 2b). Increasing doses of estradiol stimulated the vitellogenin promoter reporter activity in a dose dependent manner, reaching values higher than 50-fold induction when the estrogen was used at 10 µM (Fig. 2c). In order to evaluate the tissue specificity of the transcriptional activity of the estrogen-responsive promoter observed in hepatocytes, we tested the potential induction of the VTG-Luc construct when transfected in other non-related cell type. We evaluated the potential regulation of the DNA construct in chicken fibroblast that overexpress the estrogen receptor and found that the promoter under study is not active when expressed in these cells, even though high doses of estradiol are used to stimulate activation (Fig. 3b). On the other hand, the control reporter construct pTK-Red-ERE-LUC did show a significant induction of transcriptional activity upon estrogen stimulation, which demonstrated that the cell system used in these experiments is able to transduce an estradiol-elicited signal and activate the transcription of a synthetic promoter under the regulation of estrogens (Fig. 3a). It is to be noted that the absolute basal non stimulated activity of the vitellogenin promoter when the construct is expressed in these cells was much lower than the one observed in hepatic cells (Absolute Units of Luciferase Activity). While assessing the specificity of the effect of estradiol on our DNA construct and the involvement of the cognate receptor, we observed that doses of the anti-estrogen ICI 182,780 lower than those used routinely to block the estrogen receptor were not only unable to antagonize the estrogen receptor but also able to exert a synergistic effect together with estradiol on the stimulation of vitellogenin transcription. In experiments performed exclusively to describe this effect and based on previous preliminary data, we used ICI 182,780 at doses of 0.3 nM, 100 nM, 1 µM, and 10 µM and demonstrated that this compound at doses lower than 10 µM is able to slightly induce the transcriptional activation of the vitellogenin promoter when expressed in LMH cells. A statistically significant effect is only found when ICI 182,780 is used at 0.3 nM (Fig. 4a). When the pure anti-estrogen is used in combination with estradiol, it exerted the anti-estrogenic effect only at 10 µM, while showing a synergistic action with estradiol towards stimulation of DNA transcriptional activity when used at 1 µM (Fig. 4b). To further characterize the VTG-Luc vector in terms of hormone regulation of transcription, we evaluated the ability of the DNA construct to be induced by progestogens when transfected in LMH cells. Since progesterone is another steroid that stimulates endogen vitellogenin when the activated receptor binds to the specific response elements present in the promoter region, we expected our DNA construct to be induced by these compounds. As can be seen in Fig. 5a, the progestin medroxyprogesterone acetate (MPA, 0.1 µM–50 µM) triggered a significant increase in the transcriptional activity of the promoter under study when doses of 10 µM or higher were used. Co-treatment of the LMH cultures with MPA and an antagonist of the progesterone receptor (RU486) abolished the stimulation exerted by the progestin (Fig. 5b). Besides, treatment of cells with MPA in combination with estradiol was able to increase the magnitude of the induction when compared with the activation elicited by the estrogen alone (Fig. 5b). With the aim of further evaluating if the VTG-Luc construct is capable of being induced by the classical signals reported to induce activation of the endogenous vitellogenin promoter, we tested the effect of glucocorticoids on the transcription of the construct under study when expressed in LMH cells. Based on the literature and for practical reasons we chose the classical glucocorticoid Hydrocortisone and we tested the effect of increasing doses (0.1 µM–28 µM) of this compound on the basal transcription driven by the vitellogenin promoter present in the VTG-Luc construct and in conditions where transcription is stimulated by estrogens. The glucocorticoid, at all doses tested, was able to induce the activation of the vitellogenin promoter, reaching a 3-fold stimulation when the steroid was present at 28 µM (Fig. 6). When LMH cultures were co-treated with the glucocorticoid and estradiol, we observed a modest but significant stimulation of transcription when compared with the magnitude of induction reached by stimulation with the estrogen alone (Fig. 6). Chickens have emerged as a promising and useful bioreactor if they can be genetically engineered to produce abundantly specific recombinant proteins in their eggs, as chicken housing and egg production is low-cost, and such proteins could be inexpensively obtained in large yields [2, 5, 6]. A prominent example of successfully producing new transgenic chicken lines that express pharmaceuticals in their eggs is the expression of the non-glycosylated human cytokine interferon α2a and other functional cytokines reported by Herron and co-workers . Besides, the use of chickens as bioreactors would be expected to yield recombinant proteins having human-like glycosylation, if they are expressed in the right tissue of the chicken . Therefore, in the study of transgenic animal generation, choosing an appropriate vector and promoter is a matter of foremost consideration. 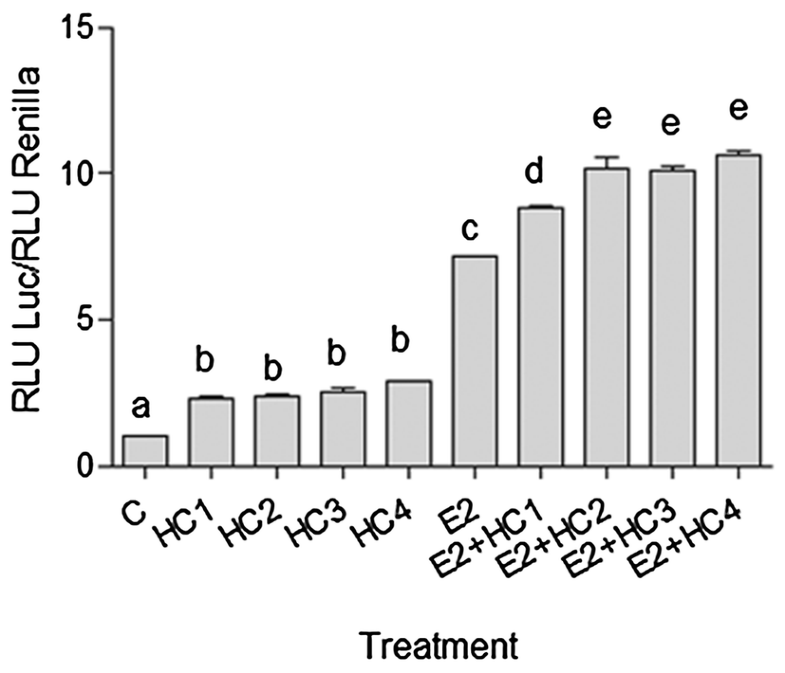 The use of constitutive strong promoters or the tissue-specific ovalbumin promoter for the generation of the existing transgenic chickens that express recombinant proteins in their eggs have different disadvantages that have to be solved in order to make chicken bioreactor an efficient production system. 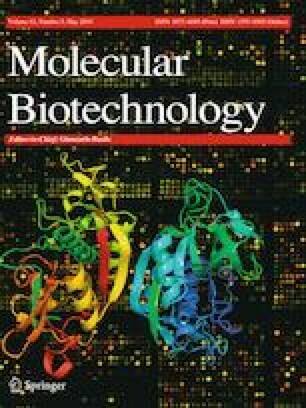 Recently, human interferon-β (hIFN-β) has been successfully produced in egg white by integrating hIFN-β at the translation initiation site of the ovalbumin locus and transgenic chickens have been generated that produce larger quantities of the recombinant protein than previous attempts did . This constitutes an important achievement, since this is one of the first reports of efficiently targeting a specific chicken gene to generate a well-controlled tissue-specific chicken bioreactor and also because the prior existing transgenic chickens expressed only very little amount of protein in their egg white [6, 27]. However, the expression of hIFN-β in the egg white remained still far below the levels of ovalbumin expression and, most importantly, the bioactivity of the recombinant factor was only 5% of the total protein produced, most probably due to misfolding of the protein . This background points to the need of a substitute tissue-specific promoter, other than the ovalbumin promoter that is directing synthesis of the recombinant protein to a tissue that lacks important sialyltransferases, the oviduct . In this work we report the identification and characterization of another promoter, the chicken vitellogenin II promoter, as a candidate for future use in transgenic chickens capable of producing recombinant proteins in their egg yolks in a tissue-specific manner. Inserting in the vector sequence the corresponding sequences for yolk uptake and for cathepsine D cleavage, both already reported and validated [28, 29], would allow the foreign peptide only expressed in hepatocytes to be then directed to the ovary and taken up by the growing oocyte, where it would be naturally cleaved from any unwanted DNA fragments. This would finally result in the desired protein of interest being accumulated in the yolk of the transgenic hen. In fact, addition of the cDNA sequence of the Fc Ɣ4 fraction of human IgG (sequences sufficient for yolk uptake, ) to the DNA reporter construction resulted in protein sequestration and the recombinant protein being found in the yolk of eggs laid by White Leghorn hens previously injected in the wing vein with the recombinant proteins products of the DNA constructs (unpublished data). We demonstrate that the regulatory sequence included in our construction (a 2.2 kb fragment of the 5´-flanking region of the vitellogenin gene) is capable and sufficient to promote specific and apparently efficient expression of a reporter protein, showing exactly the same type and magnitude of regulation that the natural endogenous vitellogenin physiologically has. Not only estradiol stimulates transcription of the promoter under study in a way that closely resembles physiologic regulation of vitellogenin [30, 31], but also a pure anti-estrogen at specific doses is able to induce activity of the promoter or synergize with estradiol, just exactly what has been reported for vitellogenin in liver, but not other organs, in fishes . Regarding glucocorticoid and progestogen regulation, both modulations previously reported for the chicken vitellogenin promoter are verified for the regulatory region present in the DNA construct described herein [17, 33, 34]. The progestogen MPA activates the VTG-Luc construct and via the progesterone receptor, since we show that the progestin antagonist RU486, which binds to the cognate receptors, is able to block the stimulation in our experiments. As expected, the induction of the promoter by MPA is less potent than the one exerted by estradiol, and is further verified in the presence of the estrogen. This is in accordance to what is observed for example for vitellogenin protein in fish hepatocytes or in hepatopancreas of crayfish under the proper hormonal milieu [35, 36]. In Japanese quail, progesterone also stimulates in vivo the synthesis of vitellogenin mRNA in the presence of estradiol, but the opposite effect is verified when the progestogen is administrated alone . Apparently the exact modulation that the progestogens exert on vitellogenin synthesis depends on the species under study. The same applies for glucocorticoid regulation of this promoter region. We observed a three-fold induction of transcriptional activity when hydrocortisone is added alone to the hepatocyte cultures and a two-fold induction of transcription when it is added in the presence of estradiol, what is in accordance with previous reports not only performed in vitro with the chicken promoter region  but also with observations in Xenopus, where glucocorticoids act together with estrogens in regulating the synthesis and secretion of vitellogenin . The opposite, however, is observed in other systems and species like fishes, where cortisol inhibits the synthesis of vitellogenin (for example, see ). Once again, the type of regulation exerted by this group of steroids seems to depend on the system under study and/or the exact hormone or compound used in the stimulation. In search of a more convenient culture system alternative to primary chicken hepatocytes, we have validated in a previous study the LMH cell line . We have reported that these cells express substantial amount of immunoreactive estrogen receptor and that they can transduce signals elicited by estradiol and activate the consequent transcription of a heterologous reporter gene in a way comparable to that observed in CEH, without the need of overexpressing the estrogen receptor. This makes the cell line an ideal and promising model for the study of estrogen-responsive constructs, especially those which are aimed to be expressed in hepatic tissue. This experimental system, in comparison to primary hepatocytes, is easier and more practical to work with and does not involve animal sacrifice. In the present report, we additionally show that this culture system, along with the cultured chicken embryo fibroblasts overexpressing the estrogen receptor, are useful to test the VTG-Luc reporter construction in terms of specificity and regulation of induction. This also constitutes a proof of concept as we validate them for the evaluation of activity and tissue specificity of further or alternative constructions designed to produce in the future transgenic chickens which would express a specific exogenous protein in hepatic tissue that can be then purified form the yolk of the eggs. As stated before, a desirable feature of a DNA construct with potential for bioreactor generation is tissue specificity. This is important mainly for certain biopharmaceuticals such as hormones and growth factors, were constitutive expression is problematical due to the conserved sequences of the molecule of interest between birds and mammals (reviewed in ). A necessary requirement to be met by such a DNA construction, therefore, is the specificity regarding the cellular type in which the regulatory region is transcriptionally induced. We demonstrate that our construction is only active in hepatic cells in response to estradiol and not in other cells expressing the estrogen receptor even after steroid hormone administration. For this assays we prioritized the species (since the ultimate goal of the DNA construct is to be expressed in a hen that can be used as bioreactor) and we evaluated the promoter activity and induction in a chicken cell type. We chose fibroblasts overexpressing the estrogen receptor due to their simple and convenient isolation, purification, and culture and also because its inclusion as a control for tissue specificity in this kind of experiments has been widely used and accepted (for example, see [40, 41]. It should be noted that the basal transactivation activity of the vitellogenin promoter observed in our assays performed in CEH and LMH cells, i.e., the control non stimulated activity of the promoter expressed as absolute Unites of Luciferase Activity, was approximately ten times higher than the basal activity of the synthetic estrogen-responsive reporter vector ERE-Tk-Luc. This basal level of activity could not be inhibited by a pure anti-estrogen or an antiprogestin, as can be seen in Figs. 1, 2 and 5, but was not present in chicken fibroblast overexpressing the estrogen receptor, suggesting the presence of at least one tissue-specific additional endogenous factor present in hepatic cells that is able to induce the vitellogenin promoter transcriptional activity. This also points out to the specificity of the construct under study and future experiments are warranted in order to elucidate the nature of such a factor. The results reported in this work are important not only because of the development of a putative molecule of interest per se, but also, and chiefly, because they demonstrate that the development can be considered as a promising system with potential use in the generation of transgenic avian bioreactors. They serve as proof of concept to ensure the feasibility of the vitellogenin promoter to be used in the generation of future chickens bioreactors that would express the transgene in another tissue that would result in recombinant proteins of improved pharmaceutical characteristics.